College. A temple of knowledge. A place to learn and grow. Well, not quite. At least not in my experience. Though there isn’t much I’ve gained directly from attending classes (save for the cursory overview to a few subjects), I do admit I have had tonnes of opportunities to learn. And being the ever-curious soul I am, I didn’t miss out out on any. One such subject that has captured my imagination quite recently is Computer Vision, the magical technology that can make a computer ‘see’. It started about 2 weeks ago, when my friends and I were brainstorming on what to present as a Minor project. We were running late already (thanks to our first Minor project idea 1). So, while we were randomly pitching ideas to each other, I suggested making an android application that can print the details of the objects in focus on the screen, in real time. And at this point, we all hopped on to the computer vision train, waving at the stations (aka project ideas) as we passed them. This we did till we reached a project idea that was (seemingly) small, practical and achievable within the given time frame. The idea was simple. A basic software that will translate your hand gestures into commands for your computer. There was a discussion on what specific type of commands it would support (from general control like navigation through the file system, controlling brightness, volume etc to simply controlling a music application). It was later decided that we will support a rather wild-card entry, Google Chrome browser. To anyone who follows this blog, Google Chrome would be a surprise. Yes, I know me+Chrome is not a duo you see frequently, but as they say, anything for science. So, that’s enough backstory. Now on to the good stuff. Being noobs in the field of image processing, we decided to stay with python, for it was more comfortable to most of the team (excluding me, I prefer C/C++. Always.) Anyway, the development started and we did our research,found and discussed some techniques and algorithms. Fast forward - Coding. The real good stuff. There are a bunch of OpenCV tutorials available on the Internet, like this one and this one. And of course, never forget to RTFM (OpenCV docs). This gave me a good head start for the task at hand. ## Must release ACF object before exiting. The next step we take towards the goal is detecting the hand. This can be tricky and there a many algorithms that try to achieve this. In my personal experience, transforming the image into Y-Cr-Cb color space is effective, especially when coupled with Gaussian Blur and thresholding using Otsu algorithm. Don’t be overwhelmed, we’ll take them all down piece by piece. Starting with color spaces. 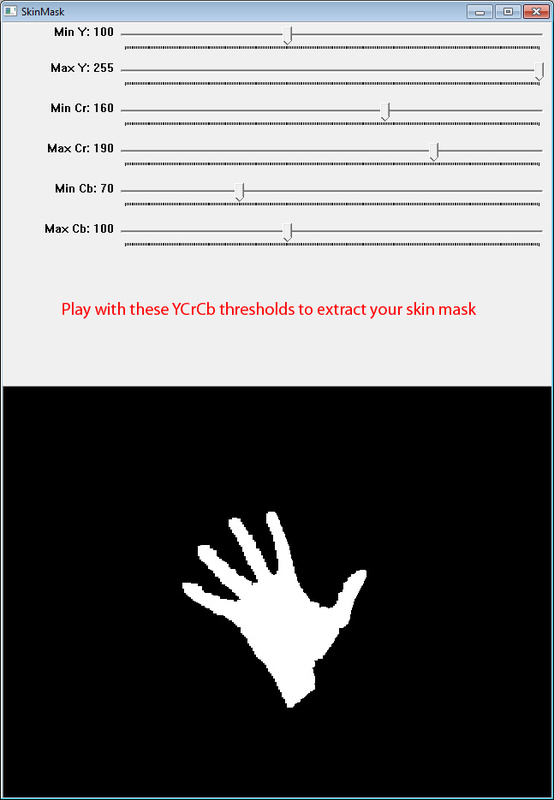 Now that we have the image in the required format, we need to find a way to identify what range of the Y-Cr-Cb values gives us the clearest view of the skin. Once we have skin, we can figure out the hand. There are again many options for finding the sweet spot. I’d recommend you do some reading/innovating of your own and find a range that best suits you. For help, you may consider reading through research papers such as this, this and this. There are plenty more so you can dig as deep as you want. I experimented both manually (by setting up trackbars and manually setting values to optimal range) and by using the elliptical boundary model for skin color detection. While manual settings offer a better and finer control, it’s a pain to adjust the values. yawnnn… OK, so now we have a nice and smooth image to work on. Looking back at it all, it doesn’t look like we have a long way, but believe me, getting here the way we did is big task. Extracting the hand out of an RGB (or BGR, as it used in OpenCV) image is half the job (well, a little less than half, but you get the point). In the next post, we’ll discuss a little more about hand exatraction, specifically blob analysis. Then we’ll continue on to detecting the hand, and experiment with algorithms to accurately detect parts of the hand. 1 The first Minor project idea was that of an automated bot that would crack Google’s new NoCaptcha reCaptcha system by imitating organic mouse movements and selecting the correct images for the given keyword. Sadly, it was dropped because of time constraints.